According to the studio's top dog, Treyarch takes testing very seriously and has the biggest QA teams it has ever had. Treyarch head Mark Lamia has downplayed the issues with Call of Duty: Black Ops on the PS3 and PC, saying that any problems that players might have encountered were not representative of the experience that most people were having. He said that despite what forums and message boards might have you believe, the experience was equally good across all platforms. Lamia said Treyarch had heavily invested in its own testing staff for Black Ops and now had the biggest QA teams it had ever had. 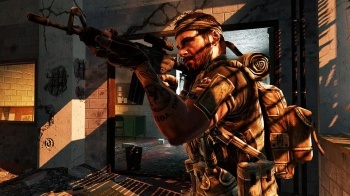 He said that while Treyarch had had the full support of the Activision test teams, the studio had taken it upon itself to ensure that people had a great time with Black Ops, regardless of platform. He said that he knew for a fact that the vast majority of Black Ops players had experienced no problems at all, whether they were playing on the Xbox 360, the PS3 or the PC. Treyarch wasn't just dismissing reports of bugs however, and Lamia described Treyarch's efforts to address players' problems as "aggressive." He said that when Treyarch became aware of complaints, it would often reach out to the player base and see it could replicate the problem. He felt that the game ran fine on every platform now, and while there were still "edge cases," Treyarch was doing all it could to deal with any lingering issues. The problem with Lamia's comments is that "the vast majority" is a rather nebulous term, and that minority could still include a very large number of people. As an example, an online petition calling for a refund for people who bought Black Ops on the PS3 has reached nearly 18,000 signatures. This is a tiny portion of the total number of people who bought the game, but it's still enough to fill a small town. It also doesn't help when Treyarch makes mistakes like the one it recently made with the 1.06 patch for Black Ops, which told PS3 users that they wouldn't be able to use Xbox Live Party Chat while playing the search and destroy mode. It's not the biggest mistake in the world, and it doesn't really prove anything other than whoever was in charge of that text slipped up, but it doesn't help present the image that Treyarch cares about each platform equally.